Andrew Hacker's 2012 New York Times op-ed questioning the requirement of advanced mathematics in our schools instantly became one of the paper's most widely circulated articles. Why, he wondered, do we inflict a full menu of mathematics--algebra, geometry, trigonometry, even calculus--on all young Americans, regardless of their interests or aptitudes? The Math Myth expands Hacker's scrutiny of many widely held assumptions, like the notions that mathematics broadens our minds, that mastery of azimuths and asymptotes will be needed for most jobs, that the entire Common Core syllabus should be required of every student. He worries that a frenzied emphasis on STEM is diverting attention from other pursuits and subverting the spirit of the country. In fact, Hacker honors mathematics as a calling (he has been a professor of mathematics) and extols its glories and its goals. Yet he shows how mandating it for everyone prevents other talents from being developed and acts as an irrational barrier to graduation and careers. He proposes alternatives, including teaching facility with figures, quantitative reasoning, and understanding statistics. The Math Myth is sure to spark a heated and needed national conversation not just about mathematics but about the kind of people and society we want to be. 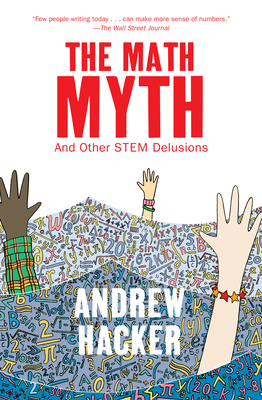 Andrew Hacker is the author of ten books, including The Math Myth: And Other STEM Delusions (The New Press) and the New York Times bestseller Two Nations. He teaches at Queens College and lives in New York City.